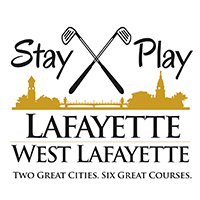 Frankfort Commons is a beautiful, 18-hole public golf course open seven days a week located in the heart of the Gem City, Frankfort Indiana. Designed by Charles Maddox, the golf course was established in early 1926 and features small, well-manicured greens that are accented by numerous sand bunkers. The game can be played by players of all skill levels yet still be challenging due to towering pine and oak trees, hidden mounds, quick smooth greens and the Prairie Creek running through the course. The city of Frankfort takes great pride in Frankfort Commons which carries a very prestigious history. Its accessibility and pure beauty make it one of the finest facilities in Central Indiana. If you have never had the chance to visit charming Frankfort, Indiana, we would strongly recommend doing so! Please call 765-659-1324 for current rates. Call 765-659-1324 for rates and tee times. Contact Frankfort Commons at 765-659-1324 for more information and details on holding a golf outing at the course. Contact Frankfort Commons at 765-659-1324. Contact Frankfort Commons at 765-659-1324 for onsite or nearby dining options. This profile was last updated on 03/20/2018 and has been viewed 6,356 times.